Discussion in 'Game Ideas and Prototypes' started by thebanon, Mar 28, 2018. To implement these world physics or not? That is the question. For the sea of time to follow. Only in truth all may see her. 0VERSE is an open-world role-playing game. It takes place on Sol, a universe with one planet, one sun, and one moon, and plenty of stars. The antagonist and protagonists are from two different universes. Sol is changing, NPC behavior, native monsters missing, alien creatures increasing, fluctuations in EXP curve due to the amount of antimatter being generated in secret locations. Who is doing this, what was the ancient world, where are these new monsters from, when will this be over, why is this happening? The goal of the game is to complete the final mission, but the story is designed to complete before all the quests are available. The plot has two parallel timelines, which converge toward the final quest. Meaning, there is no way finish every quest the first time around since some disappear. The protagonist character is equally developed as every single Party member and NPC. Currently purely conceptual, there shall be a real-time turn based battle system. An attack rate variable will limit the frequency of button-mashing. This is where it gets interesting, since most of my ideas were world-based. Theoretical scientists on Sol believe their world has no shape and their physics can be defined in multiple ways. This requires vehicle-mode world-map system. Connected maps for ground exploration & Mode7 for flight or sea travel. Arcs are created by obtaining artifacts. Artifacts can only collected after completing a certain series of quests. XdnaX and Marquise* like this. Dunno how you<ll apply that map globe in game. But just that bit show promises. With a little bit of three.js and pixi.js., I'm pretty sure I can do a good job at creating a custom map plugin. The 3D Globe and Mode7 plugins only represent different experiences. three.js: Custom plugin to pin your current location in the world. Mode7: Used only for aerial motion, which is called Orbit view. After testing the RMMV engine, I noticed it functions like my browser. So, I made changes to my world model. The world map is 250 x 250. The area maps are 50 x 50. A grid-based world. There are 20 maps with land and 5 maps of water. The world map only has transfers, which are called 'Ports' for sea travel. These 'Ports' correspond to a certain tile on the 50 x 50 area maps. The maps are all connected by design, at one tile dubbed 'Portals'. The 250 x 250 world map is the finished puzzle of 50 x 50 area maps. This is like the HimeWorks plugin, but manually created. The world map is too big to manage events but is perfect for flying. The world is too big for the TOMY plugin, but not for an orbit map! Conceptually, my redesign states the 'Outside' tiles are for the World view, and the 'Overworld' tiles are for the Orbit view. EDIT: I realized, map sizes were shrunk from 500 x 500 to 256 x 256 probably because RMMV(48x48) <- RMVX(32x32) tiles are different sizes . This mode is dedicated to Swimming. 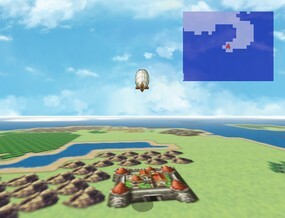 The World view provides fast transport between areas with lesser distortion by preserving the tile distances without a 'Connected Maps' plugin. The map scroll is looped around all the edges in World view, allowing players to seamlessly travel across land without any transfers. This method of travel is called Flight. Mode7 enables faster travel between continents and is required to reach the Southern continent. There are no events in orbit, except I would like to script some sort of Decay per second (DPS) in Orbit View, which incorporate the radiation. SPOILER: "True South was Magnetic North before the age of Us. ", said Her. Any new progress on this? it looks great!! The tech demo is available at https://jyxer.com/apps/overse. Jayje THE Lone Indie Cheese!